He does look posed. But his grooming is impeccable. Great coat, great sense of style, great “everyman world-weary British spy” grooming. But my question: as much as I would be honored to be one of Sart’s regulars, do you think the lucky ones who are, oft times appear a tad “camera conscious? Sometimes they don’t seem to have the spontaneity of Sart’s street shots, where the subjects, who of course are aware of the handsome man with the camera, still display delight and bon homie while being photographed. That said, let it be known that I love this site with a passion. ’til tomorrow. Great looking guy! He just looks interested in something far away and looking pensive – I don’t think he’s posing. Perfectly poise rather than too posed. 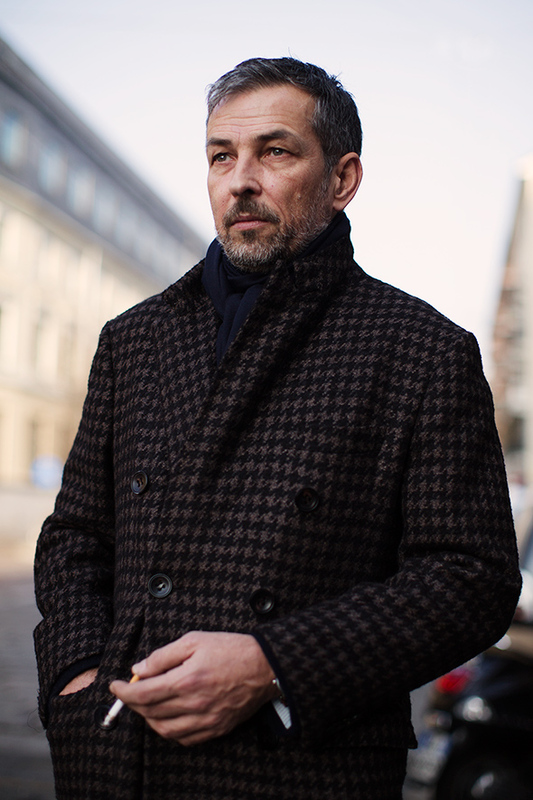 The houndstooth coat is pretty timeless,and so one of those real investment pieces. Petty it’s going to smell like an ashtray. Classy look all the same. I suppose I should say something about his look: one of my favourite shades of brown! The kind that looks like a dark mauve in certain light. Kudos for capturing it perfectly! Great shots come posed sometimes, and spontaneously natural other times. A great shot is still a great shot. Magnificent shot, Sart. Has a Robert Doisneau quality to it. Nick Sullivan always gets it right. Masculine, timeless and elegant. When my sartorial compass goes awry, I always revert to him and Steve McQueen. I want that coat. And lovely work Sart! this information very helpful to me. keep going good work.